Intel reveals its FPGA strategy, which includes the Stratix 10 and Arria 10 chips, a Storefront for FPGA workloads, and support for VMware vSphere. Three years after acquiring FPGA maker Altera for $16.7 billion, Intel’s strategy and positioning is coming into focus with the disclosure of its plans for Stratix 10 hardware and accompanying application development and acceleration stack. Altera made two FPGAs, chips that are reprogrammable to do different functions. The Arria 10, which is the low-end card, and Stratix 10, the high-performance card. The two are aimed at different target markets and use cases. Stratix 10 has much higher bandwidth and capacity, with four times the on-chip memory and twice as much DDR4 memory on the card to deliver more than double the performance of Arria. With 32GB of memory, the Stratix 10 card — twice that of Arria — and double the logic elements, the sizes of the workloads can be extended considerably vs. the Arria. Arria 10, which comes on a small PCI Express card, is more suited for backtesting, database acceleration and image processing, with a little artificial intelligence (AI) and genomics thrown in, while Stratix is a bigger card, requiring a 2U chassis, and is aimed at video transcoding, streaming analytics, and risk management types of applications. Because the development stack abstracts the hardware, you can use Arria for developing AI apps and then deploy them on Stratix-accelerated hardware seamlessly, Gomez said. The software story behind Stratix is every bit as significant as the hardware, if not more so. There is a software layer on top of the card to simplify development that Intel feels enables it to capture new markets and software developers. “In the past, FPGA design required a specific skillset. You needed to code how to code for FPGA. To get into new data center markets, we needed to implement a new software design. Here, developers don’t have to know the FPGA; they can call functions of the driver and harness power of FPGA,” Gomez said. In addition, there is reconfiguration support in the software stack, so if you want to run a different workload on the card, you can do it through the stack. You don’t need to reprogram the FPGA, which is a fairly esoteric art. When the Stratix launches next year, Intel will launch an app store called Storefront for FPGA workloads. It will include specific code to power financial, genomic, and SQL database acceleration. Just download the configuration and install it, and your FPGA will be reprogrammed for that specific task. Intel will also make the configurations available in the cloud, so you can upload a configuration and run it on your sample code in Intel’s cloud to evaluate the performance. If you like the demo, you can download it from there and run it on premises. Intel is also preparing VMware vSphere support to stream the drivers to the Linux kernel, which would mark the first time an FPGA supports a major virtualization framework. Customers will be able to leverage native FPGA performance in their virtual environment, and it will make FPGA acceleration native to the OS, so admins won’t have to program their virtualized environments to see the accelerator. 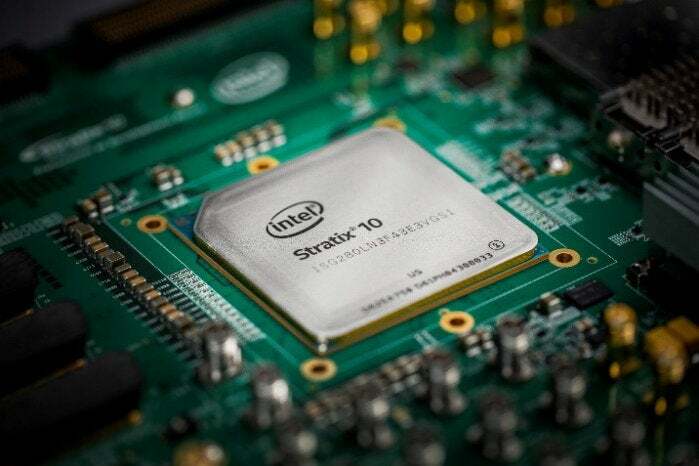 Intel is shipping samples of the Stratix 10 to OEM partners now and expects to begin production in the first half of next year.